Free night tour or an extra day free. 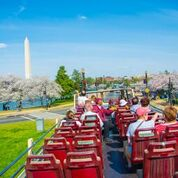 Make the most of your time in Washington DC with our flexible hop-on, hop-off sightseeing tours. 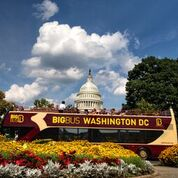 Explore the capital city's sights at your own pace - simply hop off the bus at any of our conveniently located stops, and rejoin when you're ready. Choose between two great extras. Discover DC after dark on our Night Tour, or extend your exploration with an extra day on the bus - our Premium ticket gives you the freedom to choose your own adventure. To make your choice, simply speak to a Big Bus Tours staff member when you redeem your ticket. Hop on at 7:00pm from Stop #20: White House (outside the Willard Hotel) or 7:30pm at Stop #1: Union Station. The Night Tour takes two hours and is not a hop-on, hop-off tour. Please note that Night Tour timings are subject to change without notice. Please check your ticket on the day of your tour for the most current hours of operation.